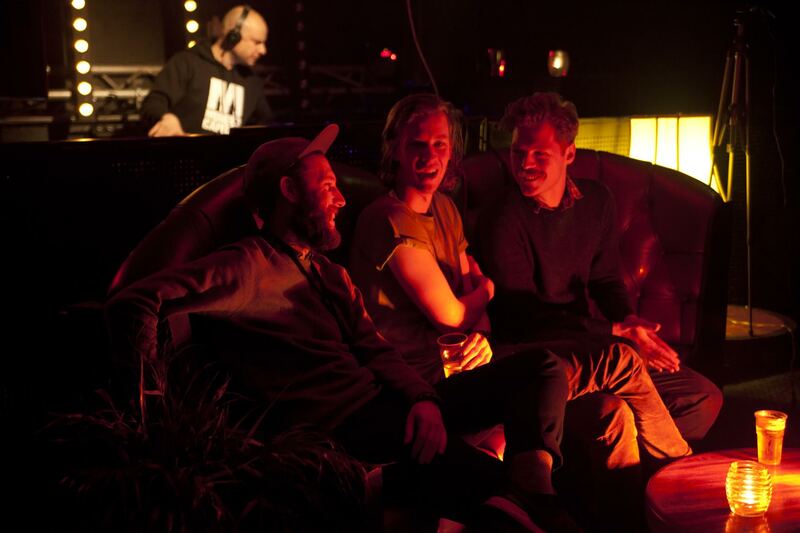 Forged along their studies at the art academy, BAKK consists of a record label (BAKK Records), a nightlife stronghold (BAKK Militia) and radio show (Odd Beat Radio) run collectively by Steve Motto, Handsome Thomas and The Social Lover. Housed around The Hague, BAKK aims to pave a path that honours its squat scene past (think Bunker, Creme and Intergalactic FM) while at the same time charting new territories. Their collective background in arts is reflected in their choices – motley and bold – whether it’s flyers, radio shows, vinyl sleeves, DJ sets or even extravagant club decoration. What is the history of BAKK? Ruben Verkuylen: We met at the art academy. Thomas van Linge did fine arts, Nicolas Borst did fashion and I did graphic design. We got to know each other through organising these big school parties at the academy. After we graduated we continued organising events in The Hague and started a record label which is still going strong. Do you also produce music? We are not producers. We are mostly focused on playing records and organising events and running our record label. We also have our own radio show on Intergalactic FM. You host events under the BAKK militia moniker. Is it something inspired by Underground Resistance and their “militantly” underground stance within the electronic scene? We are aware of the link, but we are different. We appreciate this collective effort of doing something in another way but there’s also a lot of fun involved in what we do. We’re not as tough. Going against the grain is not our main interest. Do you think that clubbing got more serious than it used to be in the past? Lot of people want to have this pretentious, high quality party. They look up to parties at Berghain and want to make it big. For us it’s more interesting to make it intimate and fun. If people want to take their shirts off, that’s ok.
You mention having been inspired by the legendary Hague imprint Bunker Records. Can you talk about your local influences? The best days of Bunker had happened before we moved here. The Dystopia parties organised by Bunker’s Guy Tavares are still going on. It embodies this different side to going out that we haven’t experienced in another place. It’s totally dark, there’re only strobe lights and smoke machines, the music is loud, the crowd is very diverse. You cannot see further than a metre ahead of you. All of this takes people out of their comfort zones and we find that very attractive. You also mention being inspired by the local squat scene. There was a big squat scene in The Hague in the ’80s and ’90s – both I-F and Guy Tavares were part of it – with infamous parties going on. It gradually died down because the municipality became very strict when it came to organising those kind of events. So it seems these are quite depressing times for the club scene. It’s been a bit of a tough time in The Hague. The municipality doesn’t allow a lot. There have been several clubs that have tried to set up a venue and didn’t get permits. Amsterdam seems to be in a better position. The Hague is a city of politics and justice and it seems like they are eager to keep everything tidy. Is BAKK and the way you operate political in some way? Not really. We truly care about creating a scene. After a while it didn’t matter where we would move to if we would organise another party. People would follow us and dress up. There’s an effort to make it as nice as possible for the people that we know locally. Can you talk about your label? The label was established in 2012. When you organise parties, do radio shows, what’s the next thing that you are going to do? Bring out a record. This was the naive starting point and then we also wanted to help our friend Robert Bergman. We thought it might be nice to continue the legacy and combine him with Legowelt whom we’d known from the parties here. That record was sold out very quickly. Then we continued with three releases which were a combination of an “underdog” and a “veteran”. For the second release we had Haron and Aurora Halal, followed by MGUN and Halvtrak. We were interested in making those kinds of odd combinations. After that we wanted to give our artists space to create more of a narrative, which wasn’t possible with one track only. We are very interested in revisiting some of the old artists whom we brought out but also looking for new ones. Our next release is by Bronze Teeth from London. We’ve also recently reissued Dark Days by Legowelt which never came out on vinyl before. Can you talk about your music direction? That’s our strength and challenge at the same time. Our musical interests can differ a lot from time to time. It might happen that Thomas would be more into wave-y techno, Nic into house and percussive stuff, and I’d want to play African disco. When we play together, it goes across the board, musically speaking. You are involved in these various aspects of electronic music: you run a label, organise parties, do radio shows – it’s almost a 360 degree approach. Is this hands-on, DIY approach important? Always. The parties we did back in the day cost us so much effort. We would have these crazy ideas like making a tunnel with elastic bands and putting ultraviolet lights on it. It took us two days to do and the same goes for the cover art for our releases, we do the silk screen ourselves. We don’t want to settle for default choices. The radio show is also very amateurish but we wanted to try it out ourselves. What is the main motivation behind everything that you do? It’s an eagerness to try new things. Like white ink on white paper with a white varnish. If it’s a risky choice – but we are convinced it’s a good choice – we are going to put all our efforts together to make it a good sleeve and do it in-house. Or turning the gallery of the academy into a space where tribal and neon elements meet. It almost never happens that something really is impossible.